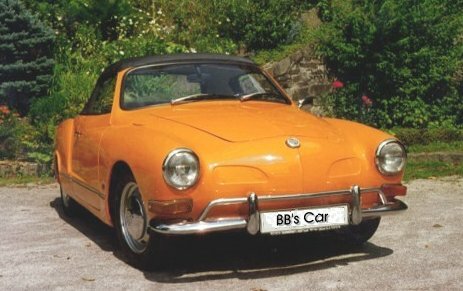 >This was my car - a 1971 Karmann Ghia Convertible as it looked in 2003. I have owned this little gem for ten years and spent a lot of time and money on improving it's condition, because it was really not in good shape. When I bought it, I didn't have much knowledge about old cars (still don't have that) and it turned out that the previous owners didn't have that either. Some horrible patchwork had been done to fill holes and replace broken parts. I quickly realised that my plan - to fix the car myself - was not going to work. So I spent a lot of money to get it fixed professionally, but in order to do a complete restoration a whole different level of work would have been necessary. The car spent a lot of time at the body shop and in my garage during those years. In some summers I managed to drive it, maybe 1.500 kilometers in 10 years. But I loved every minute with that car (ok, apart from the minutes when I was driving in the dark on the Autobahn and the rear lights didn't work, or when I was somewhere in the middle of nowhere at another KG enthusiast's and it turned out that the battery was as good as bad because the alternator was broken, or similar occasions). Well, then we became a family. A Karmann Ghia is not a family car. And then we had to move to another city. That was the point when I decided that I had to sell it, because it wouldn't make much sense to take it with me just to park it in a different garage and never drive it. So I put it on the Web for sale and a very friendly guy from Belgium bought it. I think he didn't have more clue about old cars than I did, and so I was really afraid that my precious would end up as scrap metal. How happy was I when I received an email, almost five years later! Another nice guy* from Belgium had bought the car and this time it was a professional! He pointed me to his blog with photos of the restoration and my heart made a little jump. My cutie had found the perfect owner! As I am writing this (it took me only 1 3/4 year to finally update my site with this incredible news), the car is not complete, but huuuge progress has been made and it looks to me as like next summer, people in Belgium might see a beautiful new old car on their streets. How I envy them! I guess one day I'll have another classic car, maybe a TR6, or if I ever get rich, a 356...but this little Karmann Ghia will always have a special place in my heart. I am still searching the first owner of the car, and the current owner is interested in it's history, too. Unfortunately it went through many hands. I know it came from the US. So if you once owned a Karmann Ghia Convertible, built in July 1971, black top and orange colour, send an email. Using the photos in any way without my permission is prohibited.